The modifications made to the Type 2 coins exacerbated problems with striking up the design completely, and five years later more changes were made in hopes of bringing up all the design elements. 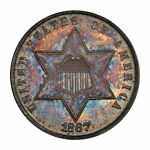 In 1859, Chief Engraver James Longacre made minor adjustments to the coin. Assisted by Anthony C. Paquet, Longacre retained the basic design of the large six-pointed star on the obverse and the Roman numeral III in the center of the reverse surrounded by the letter C, but he reduced the number of outlines around the central star from three to two. In addition, he used narrower letters and spaced them farther apart than on the Type 2 coins, and he also reduced the size of the numerals in the date. These alterations were apparently enough to make the tiny silver pieces (derisively called "fish scales") strike up better than their Type 1 or 2 counterparts. Unfortunately, after these changes were made and the Mint produced a better quality product, the coins only circulated for four years. The outbreak of the Civil War would again cause all silver coins to disappear. In the mid-1850s, the Mint paid a price for bullion slightly above the current market price, a practice that effectively divided the seignorage (the profit the Mint derives from producing coinage) between the government and the bullion owner. This meant that the amount of silver coinage was not determined by the public's need for change but by the amount of silver bullion sold to the Mint. As a result, there was a tremendous surplus of small copper, copper-nickel and silver coinage in the nation in the late 1850sso much that small coinage was looked upon as a public nuisance. When the war broke out, this situation was radically altered. The federal government suspended specie (coin) payments for paper currency in 1862, and the glut of small change was quickly reduced to a trickle, as every coin with intrinsic value was either hoarded domestically or exported to Canada, the West Indies or Central America. The production of silver three-cent pieces during this period graphically illustrates the boom and bust cycle of U.S. coinage. From 1859 through 1862, the mintage of these small silver coins averaged 373,000 coins annually. For the eleven years afterward, annual mintages plummeted to an average of only 8,171 coins. 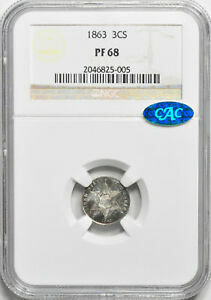 All Type 3 silver three-cent pieces were struck in the Philadelphia Mint. Over the 15 years represented by the design, 1,581,490 business strikes were produced. This is a misleading figure, however, as most of these coins were produced from 1859 through 1862. After 1862, virtually no silver three-cent pieces found their way into the channels of commerce, and both the business strikes and proofs remaining on hand at the Mint in 1873 were melted in the summer of that year. 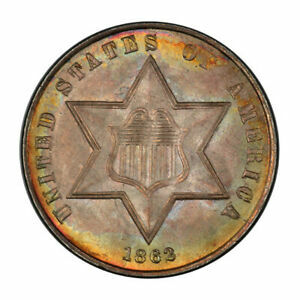 As a result, business strikes from 1863 to 1873 are great rarities. Consequently, few collectors are willing to attempt completion of a set of business strikes of the Type 3 design, and today silver three-cent pieces are almost exclusively used as type coins. Oddly enough, some high grade business strikes known from this period actually came from proof sets. Apparently, in the 1860s and `70s, the Mint was not careful about the distinction between the two methods of manufacture, and if a proof was not available for sets, a business strike was substituted. Proofs were made in each year of the Type 3 series and the scarcest date is the proof-only issue of 1873, of which only 600 pieces were struck. At least two business strike overdates exist: the relatively common 1862/1 and the very rare 1869/8. 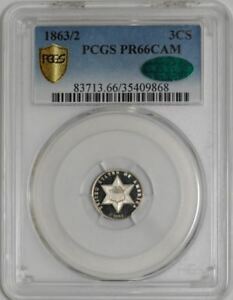 An overdated proof is known the 1863/2a rarely encountered coin that is technically a restrike and apparently produced in 1864, along with some restrike proofs bearing that date. When grading silver three-cent pieces, it is often necessary to use a magnifier because of the small size of the coin. Friction first shows on the top ridges of the star on the obverse and on the Roman numeral on the reverse. Counterfeits were made in large numbers during the Civil War, but the date and lettering differ from authentic pieces, and these pieces were not struck in silver but in some form of so-called German silver (a nickel alloy). Dangerous forgeries surfaced in 1984 of the 1864 dated restrike. 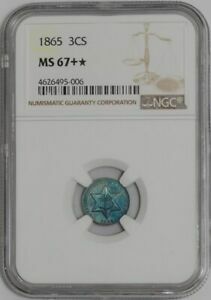 These pieces allegedly originated in England and differ from genuine coins, as the digits of the date are thinner and placed higher in the field, and all show a dent on the lower left corner of the obverse star. When silver three-cent pieces were abolished by the Mint Act of 1873, few people noticed. The coins had not been seen in circulation since the early days of the Civil War, and they had become redundant to the nation's coinage needs when the nickel three-cent coin was successfully introduced in 1865. 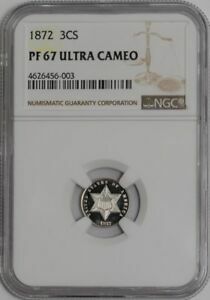 Today, only numismatists remember these tiny coins and the important part they played in the nation's coinage system in the late 1850s and the early days of the Civil War. Bowers, Q. David, United States Coins by Design Types, Bowers and Merena Galleries, Wolfeboro, NH, 1986. Breen, Walter, Walter Breen's Complete Encyclopedia of U.S. and Colonial Coins, F.C.I./Doubleday, New York, 1988.